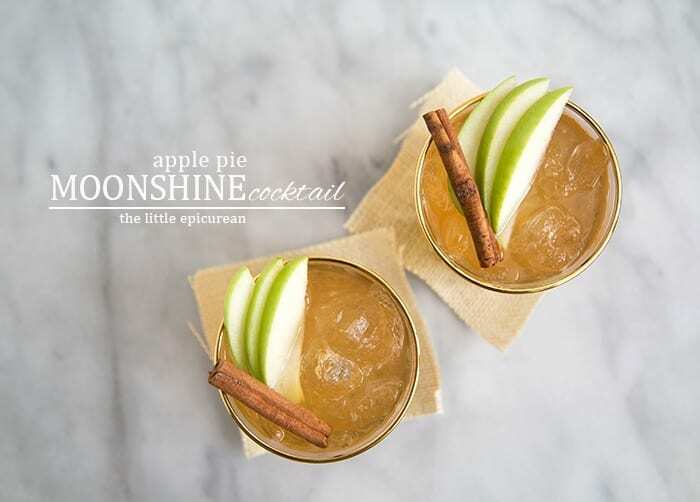 This apple pie moonshine cocktail really resembles the flavors of apple pie. The cocktail is super smooth and ridiculously easy to drink. Farewell, Summer Pimm’s Cup and Stone Fruit Sangria, it’s all about apples now! I really want to go apple picking this weekend. You may be wondering… where the heck do you go apple picking in Los Angeles? Well, about 90 minutes east of LA apple orchards exist! There are quite a few orchards to choose from in Oak Glen and Yucaipa. In the meantime, I’ll be sipping on this apple pie moonshine cocktail. Are you excited?! You should be. APPLE PIE moonshine cocktail. This is one crazy drink. It actually tastes like apple pie. I didn’t think it was possible, but this apple pie moonshine by Junior’s Midnight Moon is the real deal. This is the kind of cocktail where you can’t taste the alcohol. 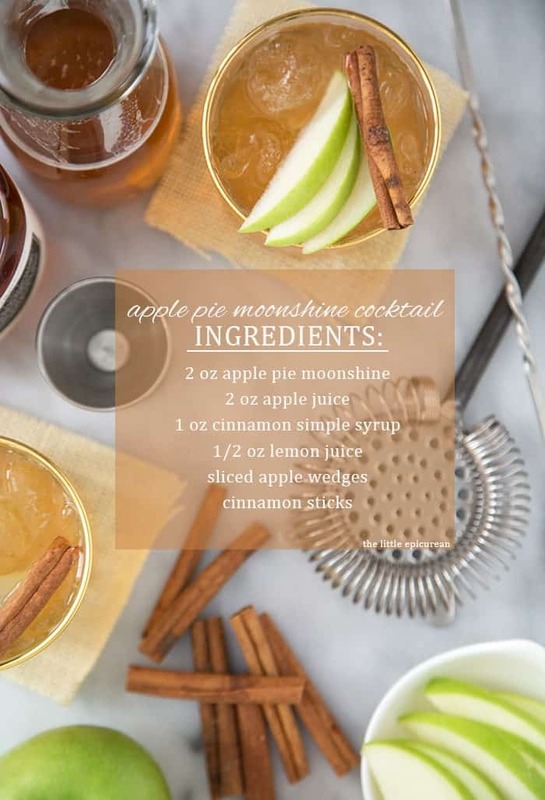 This moonshine cocktail really resembles the flavors of apple pie. The cocktail is super smooth and ridiculously easy to drink. While I’m serving this cocktail chilled, I think it would be amazing warm with fresh apple cider. You could even add a dollop of cinnamon whipped cream to make this drink even more heavenly. And if you really want to booze it up, spike the drink with a little bourbon. Just be sure to keep this drink from kids. It smells too much like apple pie, and the alcohol doesn’t hit you until it’s too late. Cheers! Have a great weekend, friends! 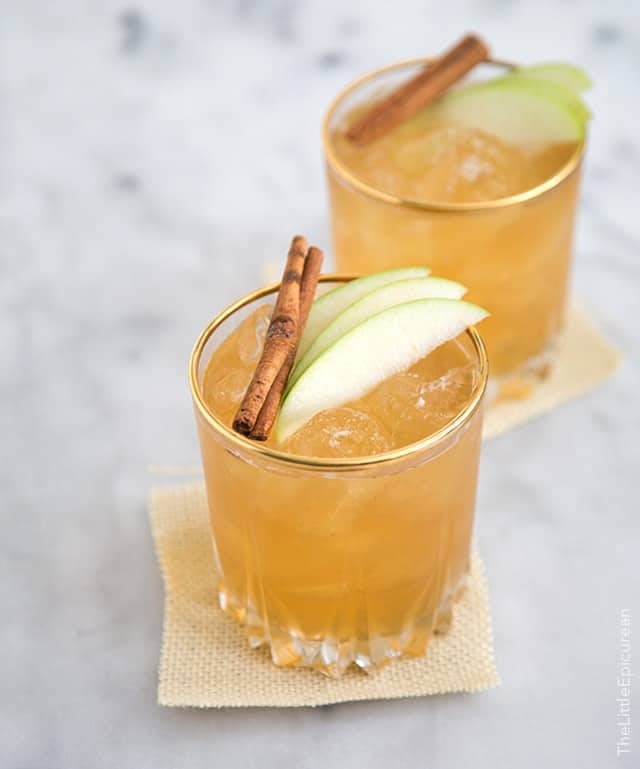 In a cocktail shaker, combine apple pie moonshine, apple juice, cinnamon simple syrup, and lemon juice. Fill shaker 2/3 full of ice. Stir for 10-15 seconds to chill drink. Strain ice. Serve cocktail with new ice. 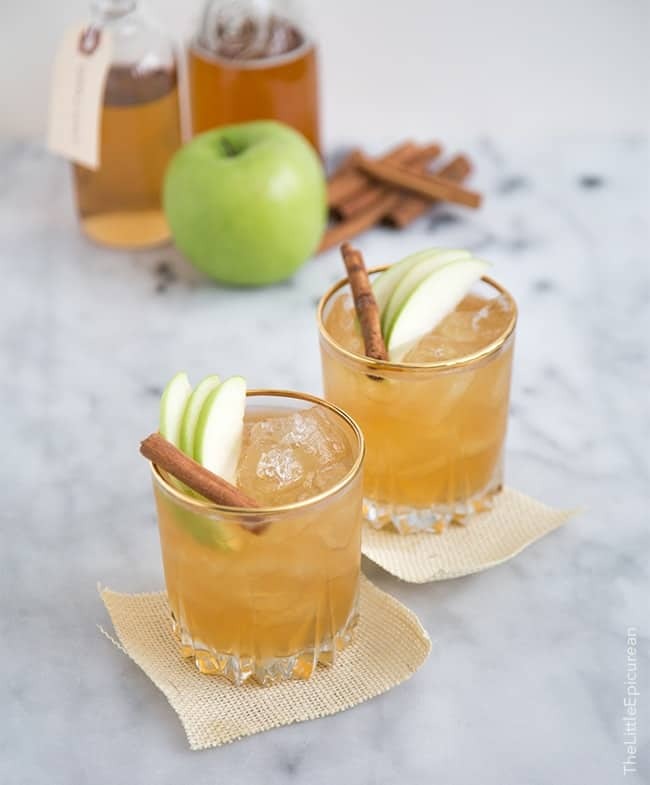 Garnish with sliced apples and cinnamon sticks. In a medium sauce pot, add water, sugar, and cinnamon sticks. Set over medium heat and bring to a boil. Remove from heat. Cover pot and let mixture steep for 30 minutes. Strain out cinnamon sticks. Allow cinnamon simple syrup to cool to room temperature. Transfer to an airtight container and store in the fridge until ready to use. Keeps in the fridge for 2 weeks. If apple pie moonshine cocktail isn’t your thing, have a look at my apple pie! Gorgeous styling! These look super delicious too! Apple pie MOONSHINE?! With CINNAMON STICK flavors?! How am I just now learning this is a thing? I’ve added it to my shopping list,! It’s amazing! I can’t wait to try their other flavors! Wish I had one of these cocktails to devour right now – they look and sound absolutely delicious. I adore your presentation of them too! I love any drink that involves apples but this one looks truly amazing! Beautiful pictures, thanks for the recipe! Do you use apple juice (like Motts) or apple cider you would purchase at an Orchard? Fresh apple cider from an orchard would be best, but regular store-bought apple juice works fine. Apple juice (like Motts) tends to be a little sweeter, so adjust the amount of simple syrup to taste. Unfortunately, you won’t get the same results with ground cinnamon. Instead of a smooth simple syrup, it will be a muddy and chunky mess. You can usually buy bags of cinnamon sticks for less than $5 at ethnic markets. This looks fantastic, and I want to make it for an upcoming party! Can you make a big batch of this by just scaling up the ingredients proportionally, or would it need additional adjustments? Hi Erin! Yes, to make a large batch simply double/triple/etc ingredients as necessary. I would mix it all in a large container (without ice). Let it sit the fridge until party time. Add ice once you’re ready to serve!